A building designed by OFFICE 52 Architecture, is as visually stimulating as it will be essential to interdisciplinary research initiatives at the university. Driving along Forbes Avenue towards Carnegie Mellon University’s campus now offers a new transformative view: the Sherman and Joyce Bowie Scott Hall, a building designed by OFFICE 52 Architecture to be as visually stimulating as it will be essential to interdisciplinary research initiatives at the university. Scott Hall fits like a jigsaw piece into Carnegie Mellon University’s campus and was designed with the university’s culture of collaboration and sustainability in mind. The building officially opened on April 30, 2016. The building itself spans multiple disciplines, housing the Department of Biomedical Engineering as well as the Wilton E. Scott Institute for Energy Innovation, the Engineering Research Accelerator, the Disruptive Health Technologies Institute, and the nanotechnology research facility. The 109,000 square foot Scott Hall has two main sections: the North Wing and the Claire and John Bertucci Nanotechnology Laboratory. The North Wing is a multicolored glass structure that sits elegantly over Junction Hollow on a sculptural composition of angled white steel columns, which are strategically placed in the overall design to avoid the utilities below. The Bertucci Nanotechnology Lab is tucked between Porter Hall, Hamerschlag Hall, Roberts Hall, and Wean Hall, turning what used to be a small service and parking area into a great deal of usable workspace. A building so unique it could only be at CMU. View more photos from our gallery. Both the Sherman and Joyce Bowie Scott Hall and the Wilton E. Scott Institute for Energy Innovation were funded by Sherman Scott and his wife Joyce Bowie Scott. The institute is named for Sherman’s father, Wilton E. Scott. Like Carnegie Mellon University, the Scotts epitomize the marriage of technology and the arts. The two met while studying at CMU, with Sherman earning his undergraduate degree in Chemical Engineering and Joyce earning a Fine Arts degree. Sherman is currently the president and founder of Delmar Systems, which he founded in 1968 and built into one of the world’s leaders in mooring systems for the offshore oil and gas industry. Joyce is a trustee emeritus of Carnegie Mellon University and an artist at the J. Bowie Scott Studio, and has been a leader in visual arts organizations in Louisiana, New Mexico, and elsewhere. John, a member of the Carnegie Mellon Board of Trustees and longtime member of the CIT Dean’s Advisory Council, and Claire Ruge Bertucci are both CMU alums. John holds a B.S. in Metallurgical Engineering and an M.S. in Industrial Administration, and built a successful career overseeing the growth and international expansion of MKS Instruments, Inc. Claire received a B.S. in Business from the Margaret Morrison Carnegie College, and her father, Arthur C. Ruge, for whom the Arthur C. Ruge Atrium is named, was also a Carnegie Tech alum. He invented the strain gauge. Learn more from CMU news. The original vision for the building was a seven-story tower built in Junction Hollow, but a progressive and interdisciplinary architecture firm, OFFICE 52 Architecture, took a risk during the initial architectural design competition for the building. The three other competing firms, well-established and large, proposed seven-story towers as requested, but OFFICE 52 decided CMU, with its innovative spirit, would welcome a more clever and elegant solution that combined technology and the arts–and they were right. The problem with the seven-story tower was that it required ripping up the major utilities in Junction Hollow, an expensive undertaking that would also cause disruptions to major essential services on campus. In addition, the building would be built on a hill by a road and railroad tracks, which was not ideal for the sophisticated labs that the building houses. “It was a wonderfully hard problem to solve, and we like difficult problems,” says Isaac Campbell, echoing the spirit of the College of Engineering. Campbell leads the project for OFFICE 52 Architecture with his partner Michelle LaFoe. OFFICE 52 turned the challenges of the location into advantages for the building: they proposed the North Wing, built on columns that are cleverly placed and sculpted to avoid vital utilities. The firm also moved the sensitive Bertucci Nanotechnology Lab up into the Hornbostel Mall adjacent to Hamerschlag Hall, which provides a flat location free from train and car vibrations for the cleanroom. 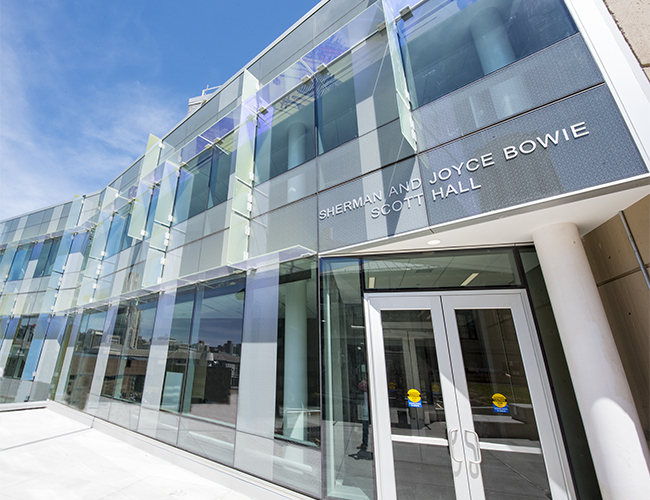 “The North Wing and Bertucci Nanotechnology Lab, plus the Collaboratory and Ruge Atrium, result in a building that connects that entire side of campus and results in impromtu meetings between those working in multiple disciplines,” says Campbell. While the building is bigger than the original proposal, it costs less per square foot than the seven-story tower and provides more space for faculty, staff, and students. Their plan also allows for a pedestrian bridge to be built in the future between Hamerschlag and Wean that will connect to Forbes Avenue, providing a safer passage that will facilitate university growth to South Craig street. 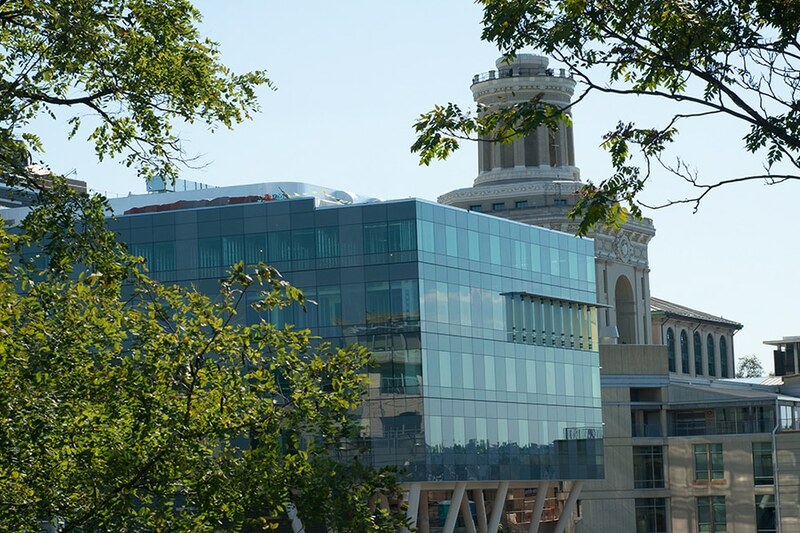 Scott Hall is a LEED Gold building, and has many adaptations for sustainability to fit with Carnegie Mellon University’s and the College of Engineering’s energy consumption goals. Cleanrooms like the nanofabrication lab in Scott Hall are one of the most energy-intensive rooms architects can build because the air must constantly circulate, and therefore pose a major challenge to energy efficiency in high-intensity research lab buildings. The cleanroom in Scott Hall is one of the most energy-efficient cleanrooms in the world. It uses an innovative fan design and increased filtration system, which allow for both the velocity of the fans and the speed at which air is moved to be decreased. Due to this creative design, the cleanroom uses 40% less energy than a usual cleanroom–impressive, since even with these modifications, it makes up 30% of the building’s energy consumption. the beauty of CMU’s campus; it also will capture rain. The green roof will reduce the amount of runoff and delay rainwater from going into the sewage system, reducing the strain on the system during storms. Some of the excess water can also be stored and later used in cooling tanks on campus. The glass used to enclose Wean Hall has a low-emissive coating on it that reduces infrared and ultraviolet light, keeping the building cooler in the summer. While this coating was more expensive, it will pay itself off easily in three years, and later save the university a substantial amount on utility bills and energy usage. Scott Hall has what the designers at OFFICE 52 Architecture call a “curtain wall”—meaning it has a lightweight, nonstructural outside covering that serves primarily to keep weather out and the occupants inside, as opposed to a house with a brick wall. In Scott Hall’s case, the curtain wall is made of glass. The architects purposely sought to artistically integrate concepts from the science taking place within the building in its architecture. For the nanoresearchers working in the building, the glass curtain wall has a special secret: it is covered in a geometric pattern common in nanoparticle research. The pattern has varying coverage that ranges from 40-60% throughout the building to allow privacy and shading for those inside, and appears differently depending on how close the viewer stands to the glass. Protruding from the curtain wall are dichroic glass fins—a type of glass known for producing multiple colors based on how the light hits it and where the viewer is standing, which results in the building changing colors as the day progresses. The origins of dichroic glass are also germane to processes that are used almost every day in nanoscale exploration. 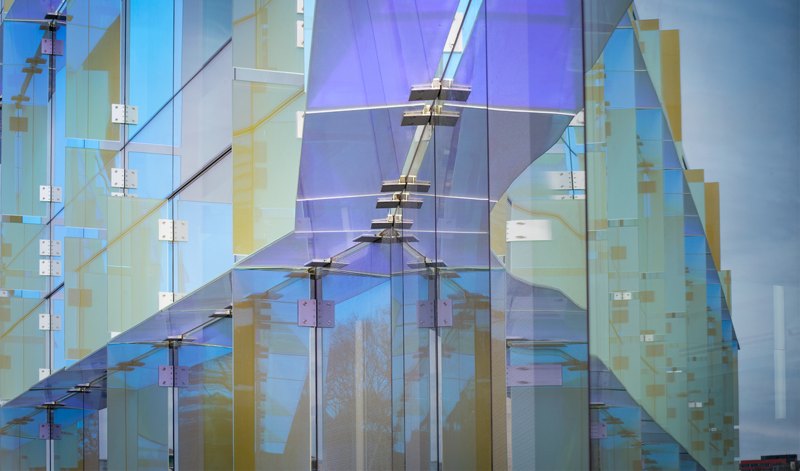 “The pattern and dichroic glass together are an architectural metaphor of how this building, from the standpoint of building and campus, is transformational,” says Campbell and LaFoe.